Yesterday I got dressed up all in jeans and wool and went out into the 85 degree day to get pictures of my long-awaited (by me anyhow) Coraline cardigan. And a close up of the smocking and buttons. I started in late September, which made this an 8-month project for no good reason. In addition to coming up with beautiful designs, Ysolda is a very meticulous writer of patterns. Not only does she provide the largest range of sizes of any designer I know of, but her patterns are very clear and detailed. 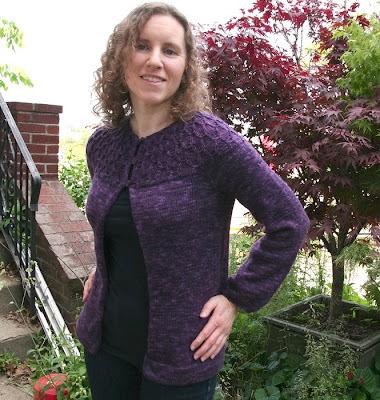 Although she has been published in magazines from Knitty to Interweave Knits, she primarily sells her patterns directly and manages to cobble together a living from knitting. All this to say, this was a nice pattern! My gauge was a bit off, despite swatching before I started and getting correct gauge (but we all know how swatches lie) so I was bit worried because the smocking requires accurate row gauge. However, the stars aligned and it came out perfectly. The only part I'm not happy with is the button loops, but you can't see them (thank goodness.) I have a vague plan to redo them, but knowing myself as I do it seems unlikely to actually happen. This is ok because they're not visible. These are the instructions, if you're curious. I used 2 plies of yarn as thread but I think it was a little too slippery and moved around and looks very messy. If I were to do it over, I'd try to find matching embroidery thread. The only thing I changed was to use fewer buttons, just because mine are larger than she used on the original. I felt lucky to find buttons in that color, never mind finding the exact size I wanted. I did something a little different on the hem as well, unintentionally, but that was so long ago now that I don't even remember what. I remember being concerned about it, but it looks fine now. All in all, a success! I look forward to wearing it a lot next fall and winter.